Description: The film starts with the street sign Lawrence Campe Close, N20, on a white picket fence. It then shows a new building, possibly new almshouses around a lawned courtyard, behind a terrace of old buildings. The gravel driveway to the new building has then got a crowd of people, clergy and a bishop all in formal dress opening the building. The clergy give a speech regarding the building and the film cuts to a shot of a plaque, this reads "These Almshouses blessed by the Bishop of London on 2nd Oct 1984". The film then shows a derelict building, possibly a school, in the process of being pulled down, a yellow digger on site. Then there is a yellow building that has a banner sign outside saying "3rd Friern Barnet ? Scout Group". Following this is are scenes of a new building being built, possibly on the site of the old one. A sign on a white board reads "Christian Enterprise Housing Association. Erection of 12 Flats, Harris". In front to the board and building are some parked cars, a VW beetle and a Ford van. A lady and her dog walk down a street passed some flats, new in appearance, followed by a Bishop and clergy staff around the flats, called "Gilmore Court", officially opening them. 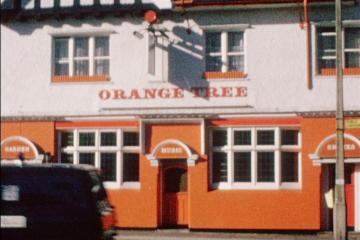 Following this section the film then shows some other buildings and signs, such as "St John Church of England Primary School", a new building and playground, and a building that is, probably, a pub "The Orange Tree"; a large building painted orange and white on the street, three entrances have a different sign over them, they read, 'garden', music, snacks'. Following are some more buildings, and a another primary school, "Holly Park School" followed by a sunset over some trees. The next shot is of a street with a road sign saying "Brunswick ? Road", there is a small corner shop on with a red telephone box outside next to the building. Above the small building is a advertisement board reading "Players No 6, Quality Cigarettes" and directly over the door is a sign saying "Guards", you can see the displays of sweets and goods that the shop offers before the film shows some street scenes of cars, pedestrians and buildings and a second sunset. The next shot scene is of the blue cloudy sky with a number of parachutes, some of the parachutes have a smoke trail behind, following on from this are more views of a church, a treelined street outside the church with cars parked down it, children walk down the street and a red mini turns around, there is also a shot of a bridge over the train lines, a red van can be seen on the bridge. The film cuts for a moment and then starts again, this time starting with traffic in the street outside a building front, the building is being pulled down and there are views of the builders outside the front, the film feels slightly older. Outside the old building are two boards reading "Pilgrim Long and Son Ltd" on one and "Sold by, Tomlin" on the other, builders working on demolishing the building. This is repeated but not sure if this the same building from a different angle or a different building altogether? The film continues with views of local parkland and then a football match, spectators can be seen in the background and a bike on the ground, this moves to 2 people playing golf. The next view shown is of "Manor Drive Methodist Church" from various angles before moving onto a lovely old row of houses or possibly almshouses, they have a large tree to the front, and white picket fence running along the length of the building. A close up on the building features show a date sign in the stone reading "1621". This is followed by views of urban streets, with houses, traffic, parks and open parkland with golf courses. A shot of a stone plinth on the pavement of a street possibly reads "Queen Elizabeths Well", pretty flower beds surround it and a red route master bus goes by in the background. The film maker then shows more views of manicured lawns and flower beds with flowers an array of colours. One flower bed has a display and a date in it, it reads "? scouts - 1907 - 1967", A large municipal building on the far side of the roundabout is then followed by a selection of building, street and parkland shots, some pedestrians can be seen in the park walking and playing. A gardner is attending some to some of her colourful flowers. A pub called "Arnos Arms" a Charrington brewery is shown, followed by an underground station building, the sign of location is not readable, the film finishes at another municipal building with a red post box in the front of the building built into the wall. There is a sign over the entrance which is quite blurred "P? Office?". I was born and raised in London N.20 and l am familiar with the locations in the film. The building being demolished is the old St. John's school the new St Johns was also shown.